Stems: Erect, much-branched. Plants monoecious; herbage light yellowish-green, sparsely to moderately stellate-pubesecent. 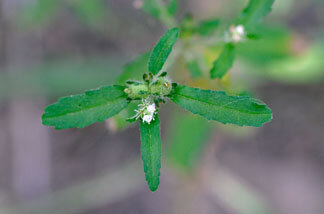 Leaves: Alternate; stipules present, inconspicuous, often early-deciduous; petiole 1/12 to 4/5 inch; blade ovate to oblong-lanceolate, .26 to 2.8 inch long, .2 to 1.2 inch wide, base obtuse to truncate, with pairs of white or yellow, discoid, sessile or short-stipitate glands near point of attachment to petiole, margins serrate, tip rounded to acute. Inflorescences: Spikes or racemes, terminal and axillary, .4 to 1.2 inch; staminate and pistillate flowers in same spike, pistillate flowers proximal and staminate flowers distal; bracts present. Flowers: Staminate flowers: sepals 5, oblong to lanceolate, less than 1/20th inch; petals 5, oblanceolate, ca. 1/25 inch; stamens 7-13. Pistillate flowers: sepals 5, oblanceolate, 1/4 to 1/3 inch; petals 0 or 5 and rudimentary; styles 3, each divided 2 times, ultimate branches 6. Fruits: Capsules 3-seeded, not enveloped by persistent bracts, globose or short-oblong, 1/6 to 1/4 inch long, 1/6 to 1/5 inch wide. Seeds dark brown or mottled, ovoid, 1/8 to 1/6 inch. Habitat: Sandy tallgrass, mixed-grass, and sand prairies, sandy oak-hickory woodlands, roadsides, old fields. Comments: Croton glandulosa is a widespread and highly variable species. Croton, tick, alluding to shape of the seeds.